This month, the centuries-old temples of Hampi are celebrating the 500th anniversary of the Vijayanagara empire with a traditional festival of folk culture and elephants, brimming with life and colour. 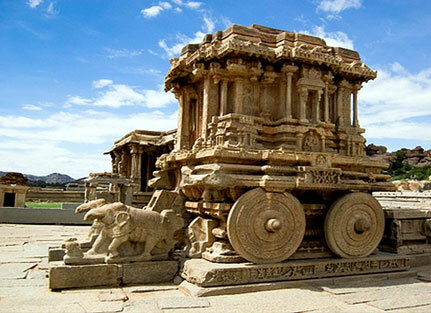 Every year, between the 3rd and 5th of November, the Hampi Utsav festival is celebrated. This time, it has been postponed until January 2010 to conincide with the 500th anniversary of the accession to the throne of Sri Krishna Deva Raya,the most important ruler of the Vijayanagar kingdom. Between 1336 and 1565, this great empire spread across the whole of Southern India. Hampi is but a small village now, in the southern state of Karnataka; however, it was the epicenter of this powerful alliance of Hindu villages whose combined military efficiency stopped the advance of the Muslims, then masters of most of the north of the subcontinent. Literature and the arts flourished in the Vijayanagara empire,which became immensely rich through trade in textiles, gemstones,spices and all kinds of merchandise brought from the Indian seaports and as far afield as China. It is in Hempiâ€™s most well-preserved shrines the annual festival takes place, attracting thousands of visitors and pilgrams from across the southern half of the subcontient. This year, the main festive days will be the from January 27 to 29, with exhibitions of dance, theatre, music, puppet shows, fireworks and crafts,as well as horse soldiers in their imperial uniforms and processsions of decorated elephants, honoring the grandeur of the Vinayanagara empire. krishnadevaraya the great.the very mention of the name thrills.soon after ascending the throne at an young age his first mission was to consolidate the vijayanagar empire which he did splendidly by expanding his kingdom to the whole of south including orissa.he then concentrated on giving a peaceful and prosperous life to his subjects.he did marvellous work to patronise and encourage literature,music and drama,arts and crafts.he himself was an accomplished army general,poet,and a vainika.all of this is authenticated by foreign tourists.in short they found him a perfect king and people happy in his rule.